Now that the R&A and the USGA have announced the final changes to the new Rules of Golf for 2019 I have taken the time to digest them and am ready to offer some initial thoughts. I do welcome most of the changes, especially those that should help to address what I believe to be the biggest problem facing the majority of amateur golfers – the time take to play a competition round of 18 holes. I do not intend to get into specific detail about individual Rules changes for two main reasons; first, the Ruling Bodies have done an excellent job of highlighting those changes with videos and explanations on their web sites; second, there are still nearly nine months before the new Rules are implemented and for those of us in the northern hemisphere, that means a whole season of golf, where the existing Rules continue to apply. I am also concerned that Club/Society Committees will not be fully prepared to handle the vast increase in the numbers of Rules situations that will inevitably occur in the early months of 2019. In the northern hemisphere many Clubs will be operating non-handicap counting competitions for the first few months, due to local abnormal conditions (‘Winter Rules’), but those below the equator will be in the middle of their seasons, where one month they will be competing under the current Rules and the next month under the new Rules, which differ in so many ways. I expect that many players will absent-mindedly take relief by dropping a ball from shoulder height instead of from knee height, and others will play a dropped ball that has rolled a few inches outside of the permitted drop relief area, forgetting that under the new Rules a ball has to be re-dropped in this circumstance. Those of us who take an interest in the Rules should assist players wherever possible in preventing a breach of Rule before it happens, by stepping in and providing information on the new procedures. In both of the above cases, the player can avoid a penalty if they are informed that their drop was not valid and they then correct their mistake before making a stroke at their dropped ball, new Rule 14.3. Note that not only have all the Rules number references changed, they are presented in a different format; e.g. currently Rule 25-1b(ii), in 2019 Rule 14.3b(2). Those of us engaged in any sector of golfing media have some additional problems to deal with. There are many significant alterations in the terminology used in the new Rules from that which has evolved over more than two centuries. Some are definitely welcome; for example ‘fellow competitor’, which was never used consistently by many golfers and golf commentators, who incorrectly referred to players in the same group as ‘playing partners’. In the new Rules they, are now just ‘players’ (not even ‘competitors’) in the same ‘group’. But how long will it be before we get used to the fact that there will no longer be any ‘hazards’ (‘bunkers’ and ‘penalty areas’), no ‘margins’ (‘edges’), no ‘outside agent’ (‘outside influence’),no ‘Conditions of Competition’ (‘Committee Procedures’) and no ‘through the green’, ‘rub of the green’ or ‘stipulated round’. I have now made the decision to continue with my efforts to assist others to obtain a better understanding of the Rules of Golf and will shortly announce a new partnership that will extend the services that I will be able to offer to both individuals and Clubs/Societies. Keep watching this space! My latest eBook, ‘Pros Getting it Wrong!’ is now also available in paperback format, direct from Amazon.co.uk and Amazon.com (just search the Books section for ‘Barry Rhodes’). Obviously, it is a lot cheaper to purchase this book, which will remain wholly valid when the new Rules become effective, direct from my web site in eBook format at this link. I for one welcome the new alternative to the stroke and distance penalty for a ball that is lost (or OB), but see one flaw with the proposed rule. Under the new rule the ball, as you say, may be dropped at the edge of the fairway, no closer to the hole than where the ball was lost (or went OB). On a straight golf hole, this seems fair. However, in a tight dog leg, where you loose the ball trying to cut the corner, this may actually give you a drop (on the fairway) much closer to the hole than you could ever hope of reaching in the original stroke - or at least much further from the location of the previos stroke than the ball actually travelled. So the penalty provides two very different drops depending on the circumstances. It would seem fairer to me that the socalled "fairway reference point" (which under the new rule is the edge of the fairway no closer to the hole than the "ball reference point" (the point where the ball was lost or went OB)) should also be no further from the location of the previous stroke than the ball reference point. So you may drop at the edge of the fairway, no closer to the whole than where the ball was lost AND no further from the location of the previous stroke than where the ball was lost. That way the new alternative can neither provide you with a drop closer to the hole, nor can it give you distance compared to the actual distance the ball travelled. What are your thoughts on this? Do you think this was considered and rejected? It would seem logical that R&A/USGA were aware of the abovementioned consequence. Have you read the full wording of the Model Local Rule: Alternative to Stroke and Distance for a Ball That is Lost or Out of Bounds? 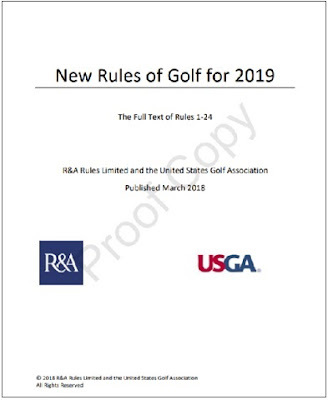 It is available on the Rules modernisation resource pages of both the R&A and USGA web sites. I am absolutely certain that the Ruling Bodies did consider the perceived problem you mention, as they have been planning these modernised Rules changes for many years in conjunction with national bodies all over the world. Some points that you may be missing are: a) the relief may not be taken if the original ball is known or virtually certain to have come to rest in a penalty area; b) the relief may not be taken if the player has played another ball provisionally under penalty of stroke and distance (which in most cases they should have), c) there is a penalty of two strokes for taking relief under this Local Rule. Thanks Barry, yes I’ve read the full wording, and yes, I’m aware of the points you make. And certainly - given the two stroke penalty - I am not saying this is something that people will aim for. I just find the consequence of the rule quite bizarre in precicely the case mentioned: if the ball is lost on the “inside corner” of a sharp dog leg. In that case you can drop on the fairway “around the corner” without coming closer to the hole. But you can certainly be further from the tee box than you’d ever hope of reaching if you went back and took another shot. I’ve always though that the point of the rule was to allow the player a drop in a spot he/she would at least have a chance of reaching from the tee if he/she went back and took another shot. I know they worked for a long time on the new rules. But with regards to this particular rule, it is my understanding that it was originaly rejected, but then came back again in the very last moment. Aldo, may I add, with regards to this point in your answer: “b) the relief may not be taken if the player has played another ball provisionally under penalty of stroke and distance (which in most cases they should have)”, my point is that: no! It would certainly be unwise for the player to do this in the situation described.